Over the next twenty years, St. Luke’s continued to grow. Her story contains the names of many who gave service, talent, and beautiful gifts to the Glory of God and St. Luke’s. In 1929, the Rev. 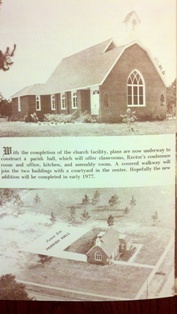 Carroll L. Bates inspired the congregation to work toward completing the much needed parish hall. During the depression, the parish hall was used extensively throughout the years by the community, sometimes as a skating rink, and for many high school dances. Stewardship in those lean times meant “one quart of milk daily and one dozen eggs weekly” delivered to the rector Rev. Mr. Schofield. By 1940, St. Luke’s sold the old rectory on Dual Street and built the new one on Westmoreland Street southof the railroad tracks in Live Oak. As always, the thrifty parishioners worked tirelessly to pay off the debt. As the church approached its 50 year anniversary, the Rev. Robert S. Snell designed a three-fold plan to make St. Luke’s Mission a full fledged parish church. 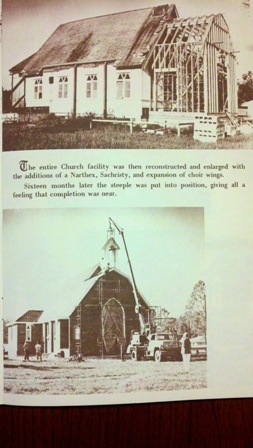 The plan was to increase the budget to $10,000, build the congregation to 125 members, and repair and improve the church. On Sunday evening, November 7, 1954, St. Luke’s became a full ParishChurch in the Diocese of Florida. The next twenty years saw the membership outgrow their beloved church on Dual Street. St. Luke’s needed a new roof and extensive repairs. Parking became a problem and trains seem to pass by at the high pointof the service. Rather than abandon their memories of their beloved church in favor of a new building, the members decided to move and renovate the lovely church. 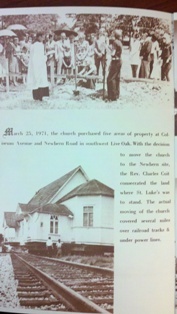 On March 25, 1971, the church purchased five acres of property at Coliseum Avenueand Newbern Road(11th Street) in southwest Live Oak. 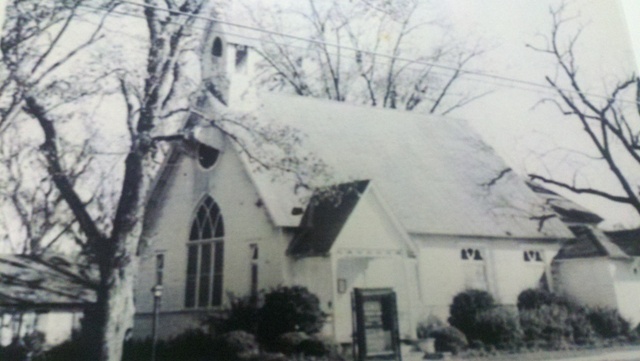 With the decision to move the church to the Newbern site, the Rev. Charles Coit consecrated the land where St. Luke’s would stand. The actual move covered several miles over railroad tracks and under power lines. The entire Church facility was then reconstructed and enlarged with the additions of the Narthex, Sachristy, and expansion of the choir wings. Sixteen months later the steeple was put into position giving all a feeling that the completion was near. Careful consideration was given to the restoration of the interior as craftsmen exercised their talents in matching the old with the new. Where ever possible original fixtures were retained such as pews, moldings and flooring. The treasured chandelier, which once hung in the nave, was replaced with eight individual hanging lights and move to the newly added Narthex along with the Baptismal Font. The addition of pews and choir wings increased permanent seating capacity of two hundred. Crimson carpeting covers a great portion of the church, accented by the efforts of the ECW’s hand stitched altar hangings and needlepoint cushions. the two buildings together with courtyard in the center. God blessed as the facility came together to form today’s St. Luke’s Episcopal Church.